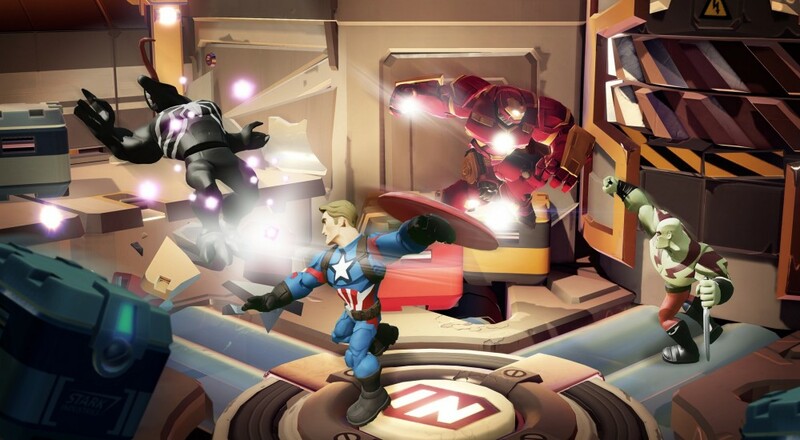 The next big play set for Disney Infinity 3.0, titled "Marvel Battlegrounds," is slated for release next spring and, as has been the trend thus far with these releases, will introduce a new gameplay mechanic. Specifically, the ability to team-up with friends to duke it out in an arena against other Marvel heroes/villains. The biggest news here is that this mode will support four-player local co-op, a series first. Marvel/Disney created an original story for this new set that revolves around Loki and Ultron teaming up to take the Infinity Stone from Asgard. To achieve this goal, they've created robotic duplicates of all the super heroes to distract the real heroes. As a comic book plot, that seems entirely likely/reasonable. What all of that translates to in terms of co-op is that you and up to three of your friends (local only) can get together and fight against three opponents from the Marvel universe of your choosing. The new set will be compatible with all Disney Infinity 2.0 and 3.0 Marvel figures. The new play set arrives March 2016 and will feature new figures for Hulkbuster Iron Man, Captain America, and Ultron. Page created in 0.6578 seconds.